The project Towards a Mobile Cloud is an activity in the Computing in the Cloud action line of EIT ICT Labs. It conducts research in order to support next-generation elastic mobile clouds, where mobile scenarios are consistently supported by cloud environments. Benchmarking and Evaluation Tools for assessing the elasticity of mobile networks, platform-as-a-service (PaaS) and for computations involving mobile devices will developed in form of demonstrators. Two major trends are currently shaping the area of cloud computing: First, the abstractions offered by cloud environments move up from infrastructure services to platform services. Such PaaS environments promise easy programming and execution environments for elastic, cost efficient applications. Second, mobile devices and mobile scenarios become increasingly important for business applications. However, their capabilities differ widely and are typically only poorly exploited. Mobile devices shall support elasticity by deciding in a context-dependant manner at run-time which parts of the required functionality shall be executed on the device and which parts shall be executed in the PaaS. Last, the interconnecting network must dynamically assign network resources, according to the fluctuating traffic requirements and network capabilities. This research activity shall explore different mobile scenarios for the cloud and characterize their needs and conditions. The underlying scenarios are based on use cases of different carrier projects, namely 4CaaST, Timbus (both EU), SenseCast (D), and Cloud Software program (FI). Based on the carrier projects we will investigate a range of different mobile scenarios, e.g. Mobile business applications for retail applications with functionality distributed across device and backend. The distribution of mobile devices across stores as well as dynamic workload patterns are expected to directly influence the requirements on platform elasticity. Mobile train scenarios, where mobile devices on passengers, a static localized cloud infrastructure on the train and a static ambient cloud infrastructure surrounding the railways form a mobile cloud. 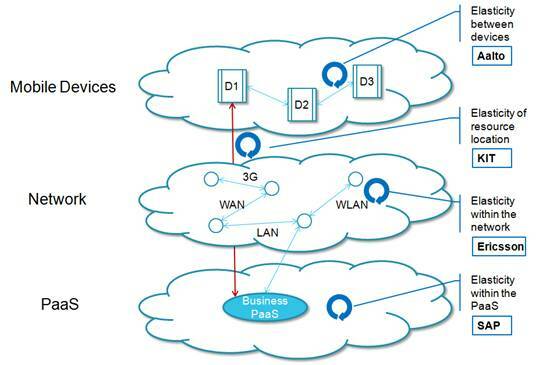 In this situation, the mobile devices may either be integrated into the cloud via long-range connections to the surrounding or via short-range connections to the train, in which case the train provides connectivity to the surrounding. Last, we consider scenarios with groups of end-users interacting with each other using their mobile devices –where device service elasticity is needed to optimize quality-of-service for end-users. These scenarios shall be systematically analysed regarding elasticity requirements and options. A classification will extract generalized aspects of the scenarios. Following a prioritization, selected scenarios will be investigated through experiments and testbeds which will apply and validate the developed benchmarking tools. The classification can later be used by scenario stakeholders to understand the relationship between elasticity aspects at the device, in the network, and the underlying PaaS and thus can be used for setting up an integrated benchmarking based on the individual benchmarking tools developed within the tasks. This interconnectivity is displayed in the figure below, which also visualizes how the research tasks of different partners collaborate and interface with each other.